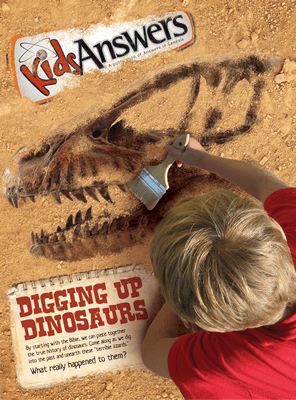 This issue of Kids Answers features dinosaurs, and even includes a pull-out dinosaur poster! By starting with the Bible, we can piece together the true history of dinosaurs. This issue of Kids Answers features dinosaurs! By starting with the Bible, we can piece together the true history of dinosaurs. Come along as we dig into the past and unearth these "terrible lizards." What really happened to them? When did dinosaurs first appear on the earth? How did they die? The Six F's of Dinosaurs—Learn the six-part history of dinosaurs from a biblical perspective (from Formed to recently Found). Why do we have so many myths about great dragons? Could some be related to human encounters with dinosaurs? Includes a pull-out poster, Same Time, Different Places—dinosaurs had homes, like we do!